We had a wonderful book launch for “What’s the Story?” in Ardgillan Castle on Saturday 8th November. Thank you to everyone who attended. Ardgillan castle reminds me of Downton Abby and I am hugely grateful to the manager, Tom, and his team for once again so generously giving us this beautiful venue for our event. “What’s the Story?” is a collection of poems and short stories written by the writing students attending my classes. One very special poem was written by Fiona Moore, a sixteen-year-old writing student, who tragically died last year. Her parents, Martin and Deirdre, drove all the way from Kerry to attend the launch and present the first Fiona Moore memorial prize. 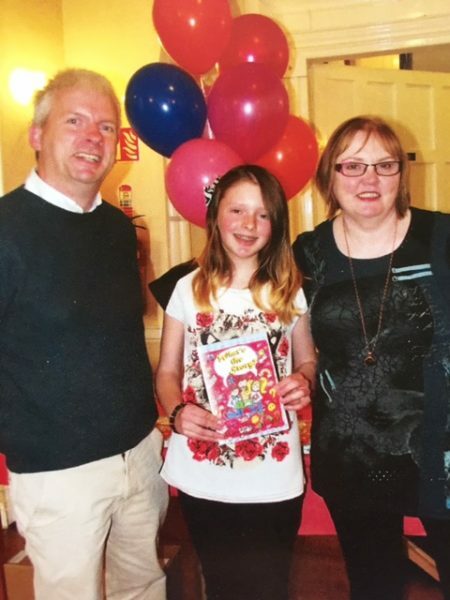 The winner of this prize is twelve year old Sadhbh Edisson, a very talented writer and poet. Here is a photo of Sadhbh with Deirdre and Martin Moore.